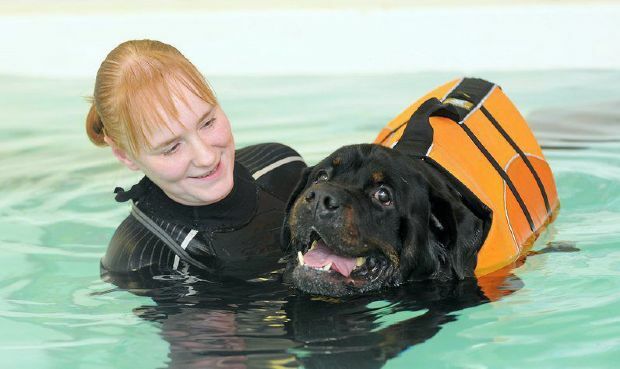 All of our hydrotherapy treatment programmes are tailored to each individual dog and their needs. Each session is 30 minutes long and all of the swimming times are dependent on the capability of each dog taking into account any injuries, conditions, stamina, fitness and age. Before any dog can attend a hydrotherapy session we need to obtain veterinary consent from your vet. 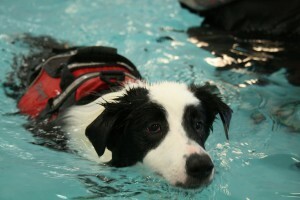 Medical Swims – Hydrotherapy can be a vital way for dogs with medical or mobility issues to stay healthy. In conjunction with veterinary treatment, hydro can significantly improve the quality and rate of healing following surgery or injury. After surgery the careful use of hydrotherapy can help with rehabilitation and increase the chance of a successful return to full fitness. Enhancing general health and fitness can aid convalescence and speed up recovery. During this programme you will have a consultation about your dogs medical condition/diet/exercise, we then complete a full gait and postural analysis and give your dog a head tail health check, then we will take your dogs muscle mass measurements and take notes. 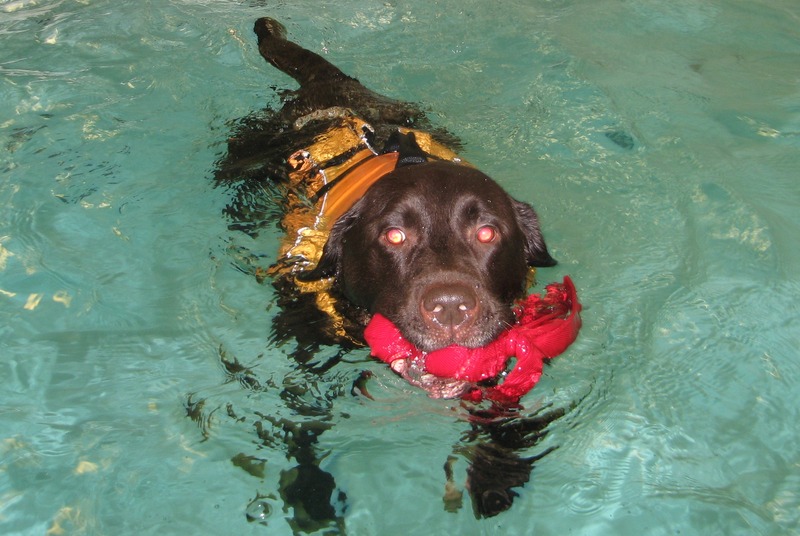 Your dog will be showered down and have a life jacket/buoyancy aid fitted prior to entering the pool. A hydrotherapist will be in the pool with your dog during their swim, after the session your dog will be shower and shampooed and either towel dried and blasted dry. Afterwards, we sit with you and explain and findings during the session and how we think the sessions should move forward, so your dog can get the most from their sessions and you can see the results you want. This will also gives you the opportunity to ask us any questions. Fun Swim – Swimming is a superb, low-impact exercise. Not only does it increase flexibility, it also builds strength and can help lose weight. This programme is a pool workout to build up fitness and agility. These swims are for reasonably fit dogs with no current injuries. Heart and lung function can also be improved or maintained through regular workouts in our hydrotherapy pool. Before the swim your dog will h ave a head to tail health check and will then be showered down and a life jacket/buoyancy aid fitted prior to entering the pool. A hydrotherapist will be in the pool with your dog during their swim session, after the swim your dog will be shower and shampooed and either towel dried and blasted dry. Weight Management Swims – This programme is for those pets that have difficulty keeping weight off. Weight management swims and regular weigh in checks will help your pet to shed those undesirable pounds. Before the swim your dog will have a head to tail health check and will then be showered down and a life jacket/buoyancy aid fitted prior to entering the pool. A hydrotherapist will be in the pool with your dog during their swim session, after the swim your dog will be shower and shampooed and either towel dried and blasted dry. Puppy swims – Too much exercise can be harmful to young growing bones and joints. Swimming is a great way to exercise your pu ppy, as it is a form of non-weight bearing exercise that will help build up muscles without causing stresses or strains. hydrotherapy is a great way of teaching puppies how to swim in a safe and secure environment so they become confident in water from an early age. (It’s also a fantastic method of getting them to burn off some of their excess energy!). Before the swim your dog will have a head to tail health check and will then be showered down and a life jacket/buoyancy aid fitted prior to entering the pool. A hydrotherapist will be in the pool with your dog during their swim session, after the swim your dog will be shower and shampooed and either towel dried and blasted dry.